North Manchester, IN – As the parade lineup formed just before 9 a.m. last Saturday morning for Peabody Retirement Community’s 18th Annual Tulip Festival, it seemed appropriate to have Coach Ousley roll up in his golf cart to kick off the festivities. The song leader, Hall of Fame coach, and popular Peabody resident, Elmer “Jr.” Ousley served as Grand Marshall. “I believe Jr. was named Grand Marshall because Peabody wanted to thank him for his service to the community,” says Ousley’s wife, Linda. Before becoming a Peabody resident, Jr. had served for years as a song leader at the Amazing Grace Community Church that he and Linda attended in Sidney, Indiana. So when Jr. moved to the Frank and Laura Smock Memory Enhancement Center three years ago, he graciously continued the tradition at Peabody—where he has been a constant inspiration to residents and staff alike. According to Mrs. Ousley, her husband has always been good with his hands—from guitar playing to ball-playing, and his chosen profession. By trade, Jr worked as a self-employed orthopedic metal finisher for nearly 50 years, honing metal bone screws and welding stainless steel hip and knee joints. The career was a wise choice since the couple lived near Warsaw, Indiana—officially named Orthopedic Capital of the World® by the city. Linda says her husband also was a good athlete. He played baseball in school, but in later life found a real love for coaching—from his grandkids’ T-ball teams to Men’s Division 1 Softball. In fact, in 2011, Jr. Ousley was inducted into Indiana’s National Softball Association (NSA) Coaching Hall of Fame. For more on the man honored with the Grand Marshall whistle, Linda graciously shared what brought Jr. to Peabody. 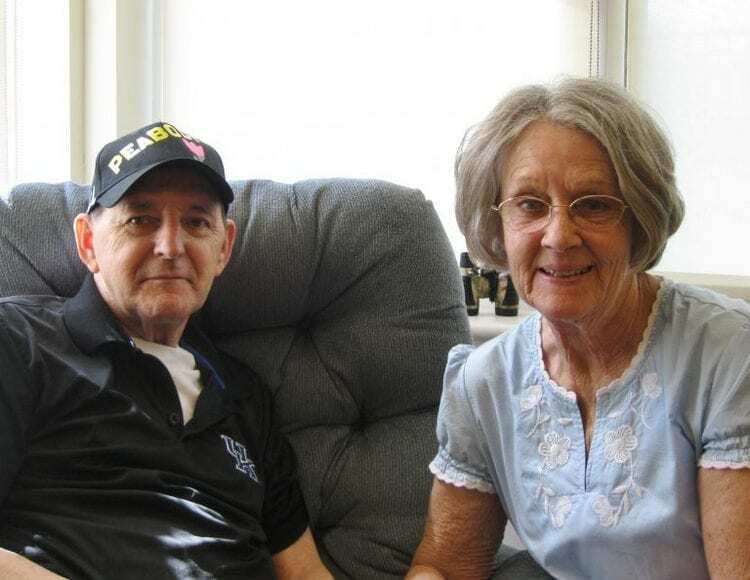 In 2012, the Ousley family got the diagnosis that their loving 68-year-old husband and father of three had dementia with Lewy Bodies, and they were advised to seek professional memory care—for Jr.’s own safety. Last Saturday, from the minute he got out of the Grand Marshall golf cart, it’s a safe guess Coach Ousley and his wife enjoyed roaming the festival. It’s equally likely The Frank and Laura Smock Memory Enhancement Center was honored to have such a generous resident presiding over activities benefiting this year’s charity: the Alzheimer’s Association. Coinciding with Peabody’s 85th Anniversary, the 18th Annual Tulip Festival was sure to be a winner. And with Peabody’s popular resident, song leader, and Hall of Fame coach to kick it off, success was never in doubt. Thanks, Coach.